Up to 50% of the annual inflows into the Western Cape's Berg River Dam catchment and Limpopo's De Hoop Dam catchment could be used up by alien plants over a period of 45 years, if they are left uncleared. This is the warning issued by water experts Dr David Le Maitre of the CSIR; Dr James Blignaut of Stellenbosch University; Prof. Lynette Louw, Prof. Tally Palmer and Mr Ian Preston of Rhodes University in a recent paper published by the Water Research Commission in the Water SA journal, titled Impact of invasive alien plants on water provision in selected catchments. the authors analyse the impacts of failing to control invasive alien plants on the future water supply in the catchments of two important dams. Alien plants are not indigenous to South Africa and have been brought into the country, either intentionally or unintentionally, and have invaded natural areas by themselves. The alien trees typically use more water than our indigenous trees and plants. Given their greater use of water and South Africa's limited water resources, it is critical to understand the impacts that not controlling these plants will have on our water supplies. This study assumed that no alien plant management would occur in the two dam catchments over a 45-year period - the average lifespan of dams built in South Africa. In each catchment, the authors base current invasion levels on data from the National Invasive Alien Plant Survey, which was conducted in 2007 and 2008. Using 2008 as the base year, the estimated costs of clearing are based on the cost of clearing, including the costs of follow-up clearing. "The dynamics of alien invasive plants are such that repeated follow-up clearing is required to counter the regeneration of the plants," explains Le Maitre, adding that a follow-up fire within two years of the initial clearing can kill all the seedlings and minimise the need for further treatments. It is important to note that the results show the estimated effects of the uncontrolled growth of invasive alien plants on river flows into the dam, rather than on yield. 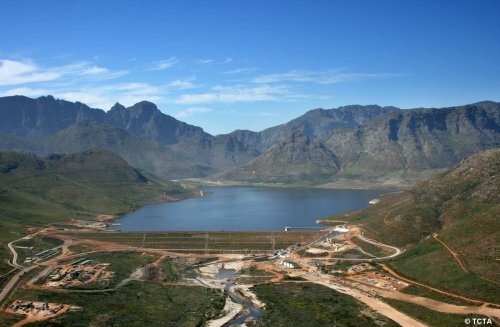 Located in Franschhoek, the dam is part of a scheme that provides water to Cape Town. The government's Working for Water programme has been tasked with clearing invasive alien plants and, at the end of 2013, spent more than R90 million clearing the equivalent of 3 600 hectares of dense stands of pines and acacias in the Berg River Dam catchment. In the worst case scenario, where the average tree age is 20 years, the invasion would increase from 3% to between 49 and 99% of the invadable area in the catchment. The result would be that river flows into the dam would be reduced by up to 50%, with significant implications for Cape Town and the irrigation schemes that depend on water from this dam. To clear the invasion at this point, would cost over 3000% more. The De Hoop Dam is located on the Steelpoort River, and is predominantly invaded by Eucalyptus and wattle species. At the end of 2013, the Working for Water programme had spent close to R3 million clearing the equivalent of 180 hectares of dense alien invasive plants in the catchment. In the worst case scenario, as per the Berg River Catchment, invasion in the De Hoop catchment would increase from 7% to between 53 and 55% of the invadable area of the catchment. River flows into the dam would be reduced by between 42 and 44% and the cost to clear the plants at this point would be over 700% more. These results, intended to be conservative and illustrative rather than precise, demonstrate the inevitable outcome of the rapid spread and densification of invasions in areas of natural and semi-natural land cover when control is not effective or not done at all. Dams are built to supply a certain volume of water at a 98% level of assurance, i.e. they are designed in such a way that water restrictions will be required in two out of every 100 years. Allowing invasions to proceed unchecked would mean far more frequent water restrictions. However, these are only two of the dams whose inflows are at risk from unmanaged alien plants invasions. "If these problems are not tackled, we will see a major water security problem develop over time across the country," says Le Maitre. Given these findings, the authors state that building a dam without a plan to clear its catchments of invasive alien plants, and to maintain them in that state, is tantamount to fruitless expenditure.